The lower Wye valley was a birthplace of modern industry, and in the 18th century the river would have run brown with coal and red with iron. The site of Tintern for industrial purposes might, from a modern tourist’s viewpoint, seem unlikely, but it offered water power from the fast-flowing Angiddy stream, a resource which had been exploited since Mediaeval times. And there was easy access to the River Wye and the Severn Estuary for transportation, trees and charcoal for fuel, and a good supply of minerals in the locality. The brass works initiative led to the construction of iron works, and in 1671 to the building of a blast furnace higher up the Angiddy Valley, which operated day and night and thus was one of the first industries to operate a shift system. 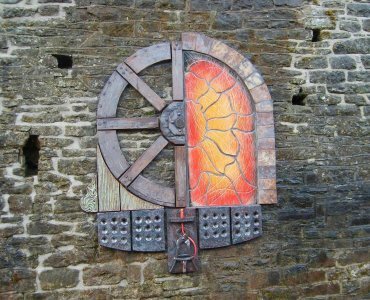 Pig iron from the blast furnace was used locally for the production of wire at three locations, or was used in Tintern or transported elsewhere in Britain for the production of items such as cooking pots, fish hooks, needles, pins, wire combs, farthingales, and bird cages. This industry flourished for several hundred years as a manufacturer brass cannon, especially during and the Napoleonic wars, and later produced wire for first trans-ocean cable laid by Brunel’s ship The Great Eastern. But live like salamanders in the fire…..
And force the latent iron from the ore. This industrial scene faded rapidly in the nineteenth century. The blast furnace was decommissioned in 1828, though not before it had carried out a series of experiments leading to the establishment of an iron and steel industry in India. Tintern may therefore justly claim to have played an important role in the initiation of the industrial revolution, but it eventually lost its pre-eminent position to regions elsewhere in Britain which offered a more accessible supply of coal and other raw materials. The excavated and restored remains of the iron works in the Angiddy Valley were opened to the public as a national heritage site in 1982. Little remains of the main wire works which is now a car park.